Sustainable Reclaimed Custom Hardwood Conference Tables, Desks, Restaurant and Office Furnishings — Urban Lumber Co.
Our collection of hand-crafted furniture showcases a variety of sizes, shapes, materials and finishes, along with useful options such as power and AV connectivity located above or concealed below the tabletop. 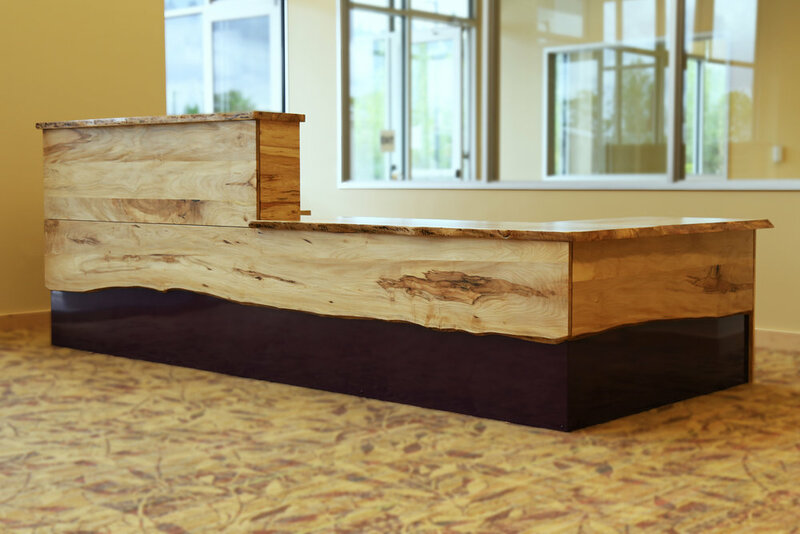 From shelving and display solutions, to conference tables and desks, Urban Lumber takes pride in creating one-of-a-kind furniture that will distinguish your Restaurant, Lobby, executive office, reception area or meeting room. All pieces ordered require approximate 8 week lead time for delivery. 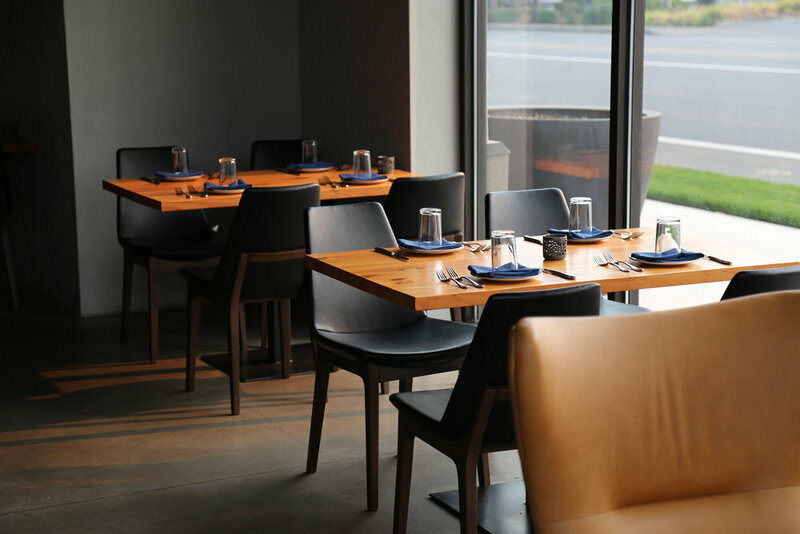 Urban Lumber Company created a beautifully sophisticated and soulful environment in this high end restaurant with 100-year-old pine and fir pulled from a local mill pond. This lumber was used to clad the ceiling, walls as well as to create the grand lighting fixture, host station, booth tops and benches. We paired a vintage, salvaged glu-lam and black steel material for dining tables throughout the space. Seth and our craftsmen created one of our most exciting projects to date! 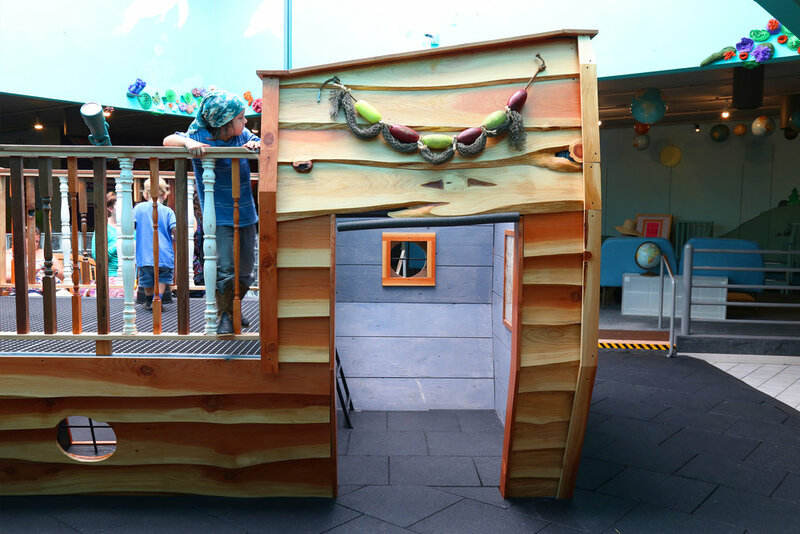 a pirate ship Made from our sustainably salvaged live edge Cedar planks. 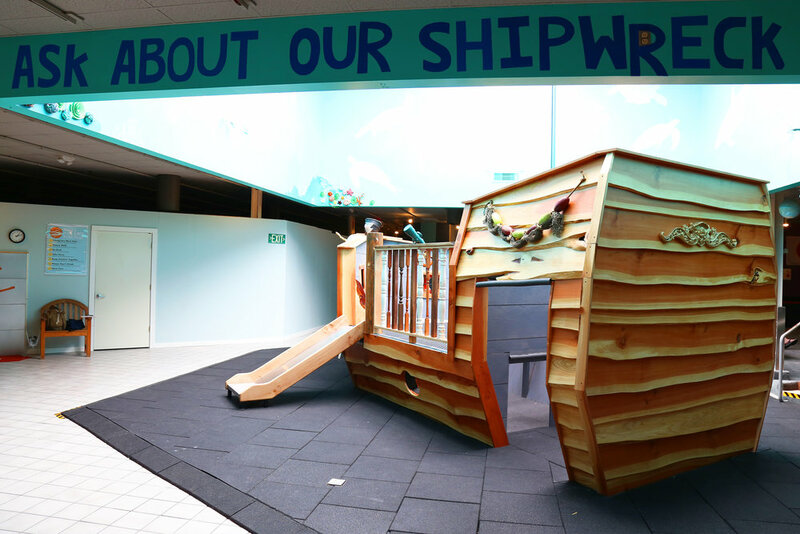 This Ship stands at 14 feet long, 8 feet wide, and 9 feet tall at the back of the cabin. A handmade Narwal figurehead with a juniper horn is mounted on the prow, guiding the way. 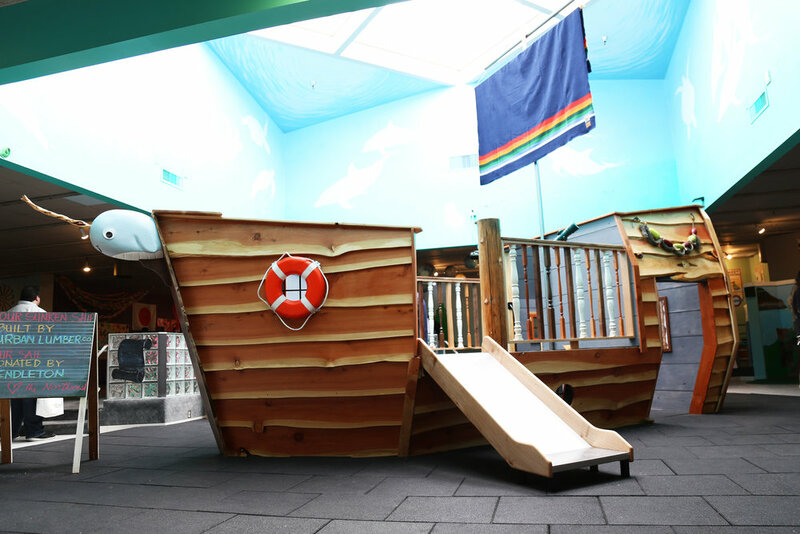 behind is a painted compass and nautical steering wheel, a pirates monocular, a 18 foot high mast in steel, a Steel slide with Maple rails, a cabin where a treasure map hangs, and an Orlop deck below. This is bound to spark the imagination in all the museum’s patrons! Urban Lumber Company designed a beautiful live edge maple reception desk with matching drawers, mixed with sheeted steel in purple powdercoat. on the second floor, the conference room sits a massive 12ft, live edge, maple conference table with built-in data ports for any technical needs, atop a black square steel base. Urban Lumber Company brings our signature furnishings throughout five rooms in the newly renovated administration building; from massive live edge maple and walnut conference tables, to an elegant walnut and steel reception desk paired with round lobby table and live edge Shelving. A beautiful maple sliding door reveals a lounge area, where soft seating huddles a maple waterfall coffee table with a matching shelving unit nestled behind the couch. Large live edge oak pub tables dominate the communal seating area in this local brewpub. A cozy oak booth and a sleek black walnut bar top in front round out the space for a relaxed environment. Beer can be enjoyed with no worries because of the tough, restaurant grade finish Urban Lumber uses, which wipes up any spills with ease. Urban Lumber Company built a striking, yet warm full environment for an Oregon District Judge. A commanding black walnut and hot rolled steel desk set the tone in the main office. The luxuriousness of the black walnut occasional tables in the two soft seating areas is pronounced even further when paired with a waterfall edge and steel accents. A conference room is furnished with a stunning conference table with heavy hot rolled steel plate base. Shelving and consoles throughout the space create a perfect blend of style and function while allows for ample storage. Urban Lumber Company built a live-edge elm table for suduri winery's tasting lounge. This beautifully grained, 12 person table has multiple contrasting walnut bowtie inlays and an "x" Trestle base in black powdercoat. Patrons gather around this table for group tastings of ornate pinot noirs, where fun, intimate conversations are had. we are proud to be a part of those connections. Urban Lumber Company brings a Unique rustic twist to the common area of this modern housing facility. A twenty foot long couch, upholstered in camo, is ACCOMPANIED by a massive barn wood coffee table resting on our reversed timberbeast base, made of black steel. Directly behind the sofa stands a live edge maple slab console table that ACCOMMODATes both decor and billiard players. In the kitchen, a Bar-height community dining table made of maple planks sits atop a steel base with castors that allows for ultimate flexibility. 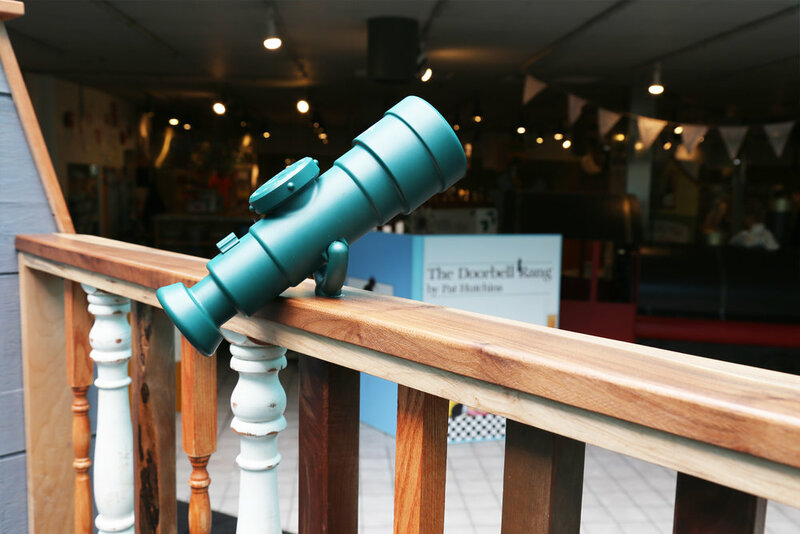 all of our dining sets are glossed with our RESTAURANT-grade varnish, for prolonged use and easy clean-up. Urban Lumber Company built a set of five matching live-edge elm tables that are A perfect addition to oracle corp's break area, showcasing the natural charismatic wood of our pacific northwest in the LONE STAR state.these tables are styled with waterfall ends, and the grain is peppered with birdseye markings, and hand-laid square inlays. 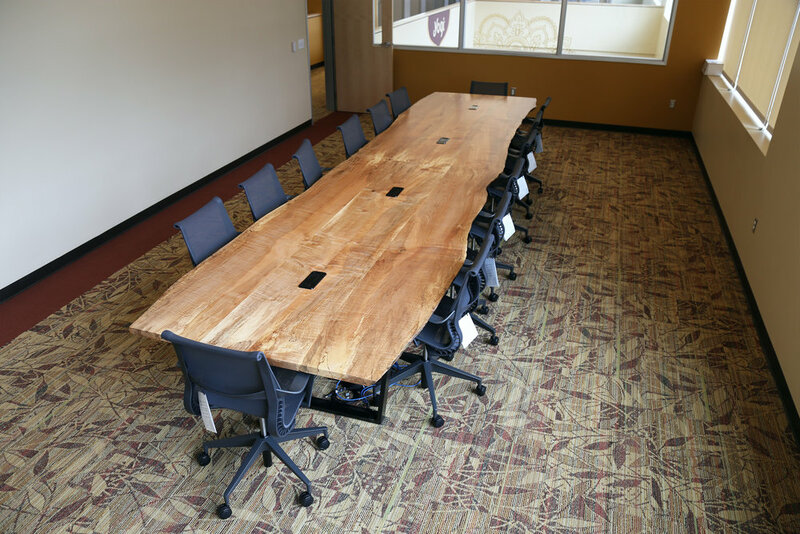 Functionality and a love for the Northwest drove the design of the various tables in this eugene credit union. a wholesome barn wood table welcomes customers into the lobby, while sleek, straight-edge fir tables occupy the conference rooms. 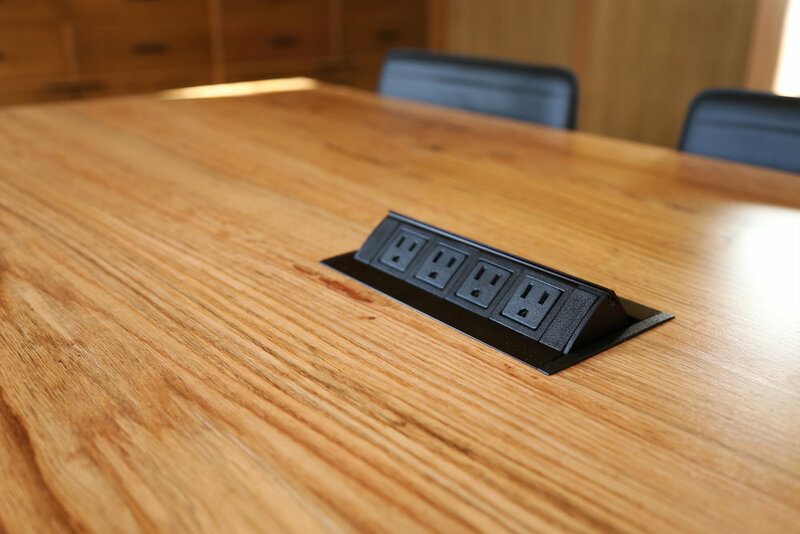 each conference table features custom data ports to accommodate the technical needs during morning meetings. The employee break room hosts a cozy round fir table and an additional warm colored barn wood dining table. URBAN LUMBER COMPANY DESIGNED A PRISTINE SET OF OAK FURNISHINGS FOR U OF O'S CHAPMAN HALL HONORS STUDENT BUILDING. OUR WORK STARTS IN THE LOBBY, A THREE PERSON BENCH WITH A MATCHING OAK TREStLE. ACROSS SITS A MATCHING bevErage STATION, WITH A CABINET for storage. SIX SMALL BOX COFFEE TABLES SIT BETWEEN ARMCHAIRS THAT CAN BE FLUSH TOGETHER OR SEPARATED FOR A VISITOR'S CONVENIENCE. TWO MATCHING WATERFALL TABLES WITH STRAIGHT EDGES ARE NESTLED IN THE UPSTAIRS STUDY. THESE TABLES HAVE BUILT-IN DATA-PORTS FOR THE STUDENTS' TECHNICAL NEEDS. Have your own custom commercial project in mind?